As the global population increases and the cost of human labour rises, food manufacturers are now embracing robotics and automation as a means to increase efficiencies, maintain a sustainable level of productivity and remain competitive in what is a complex and diverse market. 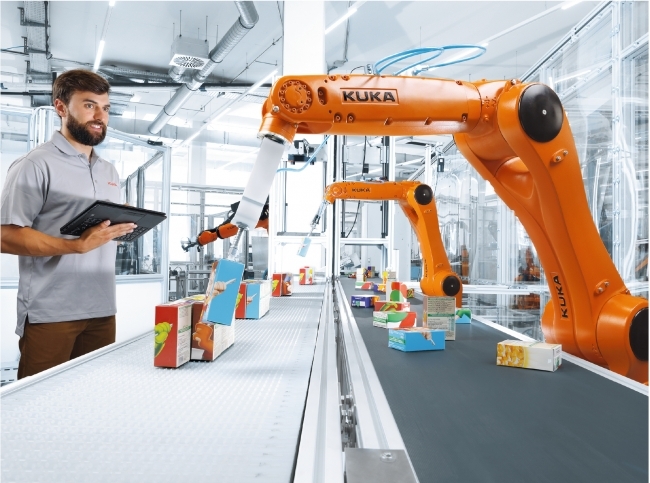 KUKA Robotics take a look at five ways automation can support the food sector. Historically robotics has been deployed downstream within applications such as packing and palletising. As consumer demand and the pursuit of sustenance has increased, however, manufacturers have had to implement automated processes further upstream within their operations, as a means to support lean production principles, aligned with market trends and consumer tastes. When we consider how the UK food market is diversifying; new packaging designs, ever shorter product cycles and an increasing diversity of variants, it’s easy to see how challenging the food industry is becoming to manufacturers. Food and beverage companies are competing on the basis that they are able to distribute a desirable, quality product, better than their competitors. 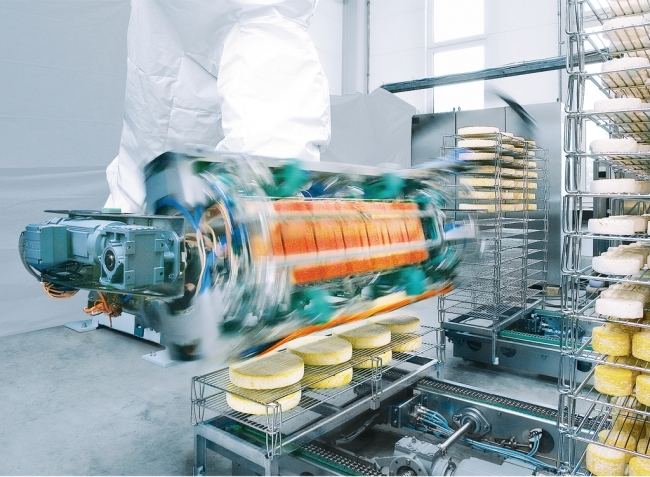 Quick and easy, reconfigurable automated processes provides both flexibility and efficiency and can play a significant role in overcoming the challenges of the food industry both quickly and profitably. But exactly where can these automated solutions be implemented and how do manufacturers go about identifying where they can add value to their existing operations? 1 – Cost savings can be achieved by replacing a human workforce in high-frequency tasks, or tasks that we consider non-ergonomic; high task repetition or tasks that require forceful exertion. RSI (repetitive strain injury) accounts for almost 5million lost working days a year, costing the UK economy close to £7.5billion. Robots however can work without becoming injured and can adapt easily to changing product cycles. Automation eliminates errors and reduces variability in output. Humans, as we know, are prone to making mistakes. We tire, become distracted or lose focus. New packaging designs, ever shorter product cycles and an increasing diversity of variants mean that attention to detail is critical. By adopting automation, manufacturers can achieve cost savings via reduced downtime through sickness and/or injury. 2 – Improved quality output can be achieved through the implementation of automated robotics to eliminate costly product recalls. Manual applications within food handling have a higher risk of contamination compared to automated processes and, can have a catastrophic effect upon a supply chain. Robotics within food processing and production processes, are being implemented more and more on production lines in order that new standards can be met and regulations are adhered to. After all, the quality and safety of a product is paramount to the success of an operation. 3 – Robots are able to operate in conditions deemed too dangerous for humans, in extreme hot or cold environments such as freezers and cold stores. Working under extremely cold conditions is inconvenient and uncomfortable. Cold fingers under bulky gloves make even the simplest of tasks difficult. Arctic robots however are designed to operate at minus thirty degrees, the temperature at which frost bite can set in. Such extreme working conditions dictate that humans are not able to remain for long periods of time, having to take regular breaks according to stringent health and safety standards, which in itself isn’t cost effective and can be disruptive to an operation. Automated robots however can continue to work without temperature fluctuations or loss of quality. 4 – An automated production line provides significant efficiencies that can translate into cost savings that can then be passed on to the customer. Reduction in both schedule and cost is an attractive USP to potential customers. By implementing automated processes the highest possible throughput can be achieved minus the increased spend. The more attractive our service offering is to our customers, the better positioned manufacturers are in retaining their competitive advantage. We should also consider that automated processes also provide a reduction in waste. Robots are so accurate that the amount of raw materials is reduced, reducing costs associated with waste. In today’s market consumers demand that their products are sourced from a responsible and sustainable provider and customers will actively look to partner with a socially responsible manufacturer. 5 – Implementing automated, robotic processes isn’t as expensive as it may sound and the returns on investment can be evidenced relatively quickly. Automation requires a significant investment of capital, that is clear and businesses will need to change the way in which they operate. Though consider the alternatives. Our competitors automate and provide a more cost effective alternative to our customers, gaining that competitive advantage and market share. However, robotic automation is a long term strategy. Cost savings are achieved over time as the benefits from improved efficiencies, production throughput, safety and quality add up. The food industry is changing, that is clear. A new generation of consumers is now dominating the marketplace, with complex diets and eating patterns that dictate food manufacturers must change the way in which they operate.